Is the concept of service delivery indelibly embedded in you? Do you thrive on serving others and enjoy educating clients with the knowledge you have acquired? We are currently recruiting chartered accountants and chartered tax advisors to join our team in Bandon, Cork. If you want a job with a difference, with a great work life balance close to the beach in the heart of West Cork? Then you need to join our team. Due to recent firm wins we are recruiting chartered tax advisors and chartered accountants. We are interested in discussing opportunities with both Irish & UK accountants and tax advisers. All interested candidates should email their CV to caroline@charlespcrowley.com or call 023-8841899 or from outside Ireland +353 23 8841899. CPC is a people driven business and as such we take great pains to select the best fit for the team and our clients. We invest in career development and associated training to ensure our clients benefit from nothing but the best skills the market has to offer. At CPC, you will find like-minded, talented and creative people who want to make a positive difference. 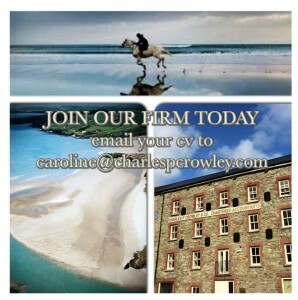 Please send your CV along with a short summary to Caroline Crowley on caroline@charlespcrowley.com . Please be aware that due to the number of CV’s we receive we unfortunately cannot reply to all applicants.